Finally—it’s been a long, long time—a horror film that delivers on nearly all fronts. From the opening frames in an abandoned all-purpose store (drugs, food, toys), it is evident that both sound and the lack thereof will fuel the apocalyptic narrative with scenes which purposely rely on show and much less tell. After 472 days in from the invasion of the creatures, the world has become a very different place. The terrifying long-legged human-like crustaceans are as blind as justice. The only way to feed themselves on tasty humans is to use their super sensitive hearing to find their prey and chow down. The few remaining survivors have learned to walk barefoot, construct sandy paths, communicate with sign language and spend much of their days in basements—out of sight, but more importantly, out of sound. Director, co-writer (along with Bryan Woods and Scott Beck) and actor John Krasinski has come up with a production that has much to say about humanity’s incredible instinct for survival against all odds. In the acting department, he is the patriarch of the Abbott clan, using his knowledge of science to devise a number of ways to keep his family from becoming meals for the beasts with monstrously sharp teeth. 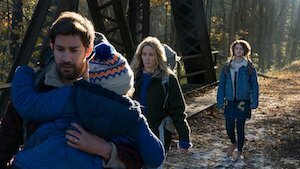 Krasinski digs deep into the notion of “I will protect” my family, proving that notion without a doubt by journey’s end. But it’s really Emily Blunt’s portrayal of wife Evelyn that carries the film into the realm of greatness. Whether grieving a loved one, delivering a newborn in circumstances that make hell look a theme park, caring for two other children and believing in her husband’s determination to keep them all safe and—somehow—find the Achilles heel in the voracious aliens, her performance is a masterpiece of emotional control, grit when it counts, while revealing her love to one and all almost always silently. Millicent Simmonds is particularly adept at demonstrating remorse and anger with looks and actions that necessarily speak far louder than words playing pubescent daughter Regan. Her younger brother, Marcus, is rendered convincingly by Noah Jupe, gamely delivering the cliché “Tell her you love her” scene (that along with the opening inciting incident are the only writing quibbles coming across as too predictable for anyone to be surprised at the payoffs).